Lockheed Martin has "Skunkworks", the official alias for their Advanced Development Program where famous aircraft such as the F-22 Raptor and U-2 were secretly developed...inTech Trailers has "Project X". Project X is the in-house codename for our special aluminum trailer projects that are used to showcase the skills and talents of our design, engineering and production staff. Put quite simply, it is a great way for us to have a little fun and develop some incredible trailers. 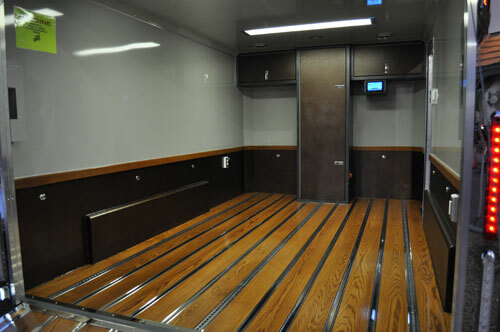 Much like the world of automotive concept vehicles, Project X allows us to push the limits of our abilities and try different ideas that we believe will help to advance the trailer industry as a whole as well as result in some very unique custom trailers. inTech is always looking for ways to challenge ourselves to build better products, Project X is the perfect platform to promote this creative environment. Many of the features you will see in a Project X trailer make it into our standard production trailers. While we feel you will agree these trailers are a true work of art, best of all, they are fully functional trailers and in the end, one lucky person is fortunate to own a truly unique one-of-a-kind trailer masterpiece. So take a moment and browse our collection of Project X trailers and see for yourself the inTech Difference! Check back often as we are continually developing new Project X trailers. Click on a logo below for more information about that project. Woody is the quintessential original Project X. Taking inspiration from the beauty of the 1950's wood pick-up truck beds, Woody, as many people have mentioned, might possibly be the "perfect" motorcycle trailer. Woody was developed not only to showcase our talents but also appear at a number of shows including the North American Trailer Dealers Association (NATDA) and the world famous Daytona Bike Week. We couldn't think of a better way for enthusiasts across the nation to stand up and take notice of inTech Trailers and, as expected Woody succeeded in grand fashion. When we first started working on this trailer it was not intended to be a Project X. To the point of Project X, we were looking to use many of the same features that we had developed for the Woody trailer to build yet another incredible motorcycle hauler. But, as the production date neared and the demands were increased we quickly determined this was to be our second Project X. So black if it were not for the #8 mirror finish stainless steel accents, this trailer would be virtually invisible at night, thus the appropriate codename, "Midnight Train". Custom paint is not a word that does this trailer any justice...the black is so deep and reflective you think you are looking into a black mirror. Midnight Train commands attention at absolutely every level. Bold, elegant, beautiful; these were all words that we were looking to exemplify when we created Midnight Train. If we were going to develop a trailer so incredible, we wanted to make certain its appearance endured for years to come. To achieve this we needed to make certain every aspect of the trailer was low maintenance and easy to clean. We used the same base coat/clear coat paint process that you would find on a high end hotrod restoration. That included a full cut and buff that brought the finish to a high gloss, glass-like appearance. All of the exposed aluminum, inside and out, was anodized black protecting the finish from weathering that is commonly seen on unprotected extruded aluminum. All of the bright trim is #8 mirror finish stainless steel and requires nothing more than soap and water to maintain its highly reflective appearance. With incredible attention to detail and foresight, Midnight Train lets you spend less time cleaning and more time enjoying your unique, one-of-a-kind trailer. In 1962, Carroll Shelby introduced one of the greatest automobiles ever created, the Shelby Cobra. Fast forward 50 years: Carroll is the inspiration behind the absolute finest car hauler every built. 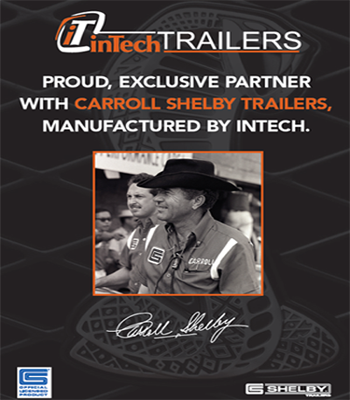 In commemoration of this event, inTech is proud to announce the limited production Carroll Shelby Trailer. 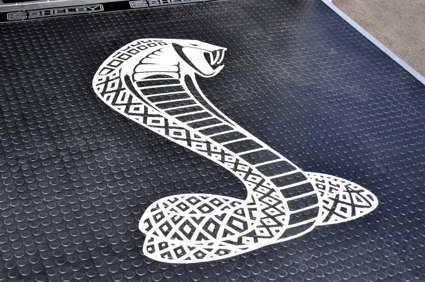 inTech Trailers partnered with Carroll to manufacture a limited edition custom trailer in celebration of the 50th anniversary of the iconic Shelby Cobra and results were astounding! It quickly became apparent that this would be the perfect opportunity to become the next Project X. Expectations on the first Shelby Trailer were very high and we were not about to disappoint the legendary car builder. Set to debut at the 2011 Team Shelby Nationals in Tulsa, Oklahoma, the first trailer was not pre-sold. We were going to build what we thought Shelby enthusiasts might like to see. Not surprisingly the trailer sold the second day of the event and now resides in a climate-controlled facility sitting alongside an extensive Shelby collection numbering more than 17 automobiles. The trailer will only transport Shelby automobiles! Only six trailers will be produced, each one different from the other and built to the exact specifications of the owner. The all-aluminum, all-tube construction is designed and built to last a lifetime. Each trailer is precision-built with a level of quality, fit and finish that stands above anything else. inTech Trailers is proud to be associated with Carroll Shelby and a portion of every sale is donated to the Carroll Shelby Foundation. The Carroll Shelby Foundation is dedicated to providing financial support to children and medical professionals to help overcome life-threatening health issues worldwide and promoting continuing educational development. The Carroll Shelby Trailer is the perfect complement to any Shelby automobile, but remember only six 50th Anniversary trailers are available. Visit www.carrollshelbytrailers.com to learn more about this exclusive product. When we decided to start manufacturing clear trailers we knew it would lead to designing something a little extra special under the Project X program. We weren�t happy with the aluminum extrusions that were available in the open market, so we designed our own extrusions to be utilized around the clear sidewall panels. We believe the end result speaks for itself. This was the first Project X trailer where we had an actual name the trailer contest...we received a lot of entries and the winner was "Clear Intentions". It's difficult to appreciate this trailer without seeing it in person; the quality, fit, finish and details throughout are absolutely jaw dropping. Clear Intentions features quite a few one-of-a-kind options (noted under "Key Points") that truly place this trailer in a league by itself. A trailer like this is for those that want the best and know the difference!